This will be the company's 21st investigation in the past five years. 4/18/18 7:20 PM ET: This post has been updated to include a statement from a Tesla spokesperson. 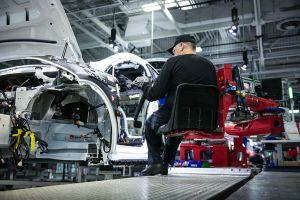 A brief summary of what got us here: On Monday, investigative outlet Reveal published a story with some pretty horrific depictions of workplace injuries happening at Tesla’s factory in Fremont, California that the company had failed to report to the proper authorities. Tesla refuted the claims in a blog post, in which the company called the story “an ideologically motivated attack by an extremist organization working directly with union supporters to create a calculated disinformation campaign against Tesla.” And now, Cal/OSHA is getting involved to actually see what’s going down. While Cal/OSHA’s statement doesn’t specifically name the Reveal story, or where the “reports of workplace hazards and allegations of employers’ underreporting recordable work-related injuries and illnesses” came from, it’s pretty easy to speculate that that’s what prompted the investigation. Cal/OSHA takes seriously reports of workplace hazards and allegations of employers’ underreporting recordable work-related injuries and illnesses on the Log 300. Cal/OSHA currently has an open inspection at Tesla. While we do not disclose details of open inspections, Cal/OSHA’s inspections typically include a review of the employer’s Log 300, as well as a review to ensure that serious injuries are reported directly to Cal/OSHA within eight hours as required by law. Cal/OSHA’s regulations define a serious injury or illness as one that requires employee hospitalization for more than 24 hours for other than medical observation, or in which a part of the body is lost or permanent disfigurement occurs. This isn’t Cal/OSHA’s first investigation into Tesla’s working conditions. A search of the federal OSHA database reveals 20 such investigations over the past five years. In a typical investigation, Cal/OSHA representatives will go to the site itself, interview employees and supervisors, and review the required safety records (including the Log 300, mentioned in the statement), the Cal/OSHA spokesperson tells Futurism. They’ll be checking to make sure the company has all the required safety plans, training for employees and employers, has completed all regular inspections, and has posted summaries of any injuries over the past three months for employees to see. And investigators will also make sure that anything investigated in the past isn’t violating codes again. If Tesla is found to be in violation, the Cal/OSHA spokesperson confirms, the company would be fined. If it’s something as simple of not completing the paperwork they should have, the maximum fine is $12,726. A “serious violation” would run them up to $25,000. And a willful violation, in which employers knew about an issue and didn’t correct it, would cause the company to be fined $127,254. The Cal/OSHA spokesperson was unable to comment on whether Tesla is cooperating with the investigation, or if it’s notable in comparison to the previous 20. The injury rate at our Fremont factory is half what it was in the final years of the UAW plant operated by GM/Toyota immediately before us, and we care deeply about the safety and well-being of our people and strive to do better every day. Cal-OSHA is required to investigate any claims that are made, regardless of whether they have merit or are baseless (as we believe these are), and we always provide our full cooperation. Last year, a Cal-OSHA investigation into our injury reporting and record-keeping was closed without any violations found and without any further action taken. In fact, unlike other automakers who in the past have been cited by OSHA for record-keeping violations, we have never in the entire history of our company received a violation for inaccurate or incomplete injury record-keeping.